The first live game auction was hosted at the second Gen Con game show in 1969. Since then, there have been hundreds of live game auctions all over the world. At each auction, gamers bring in their no longer wanted games and gaming items, to be sold either at public auction, or at a fixed price in a consignment store. Some auctions allow a “silent bidding process”, where bidders can write their bids on a piece of paper connected with an item. But the most popular auctions are ones where each item is in turn auctioned Live, with the highest bidder winning the item. Charity segments are also popular in live game auctions. Gamers are very generous, and many auctions will allow gamers or manufacturers to donate items to a charitable cause. All (in the case of Gen Con) or most of the funds raised by selling the donated items in the live auction are then given to the charity. 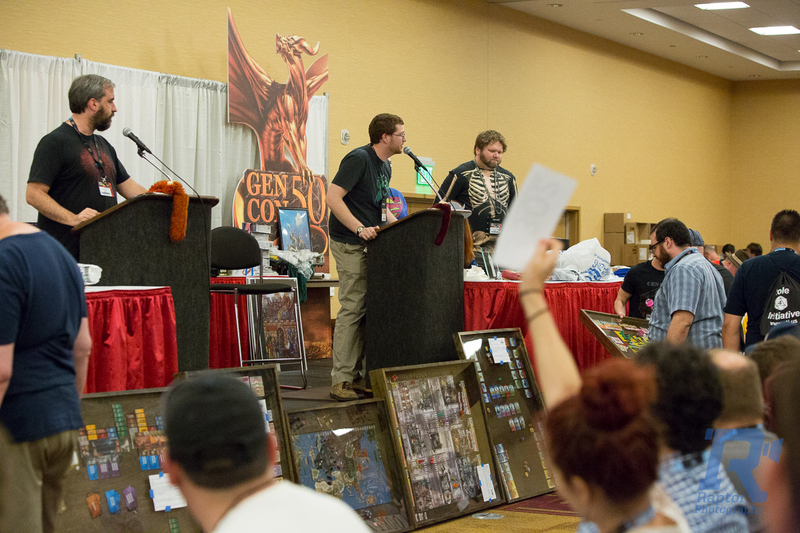 Gen Con live game auction is also famous for its charity segments. You can see details about the charity auctions here. If you want to know more about the Gen Con auction, or any live game auction for that matter, you can read details in our FAQ section. We run the best games auction in the world. Bruce Carson works as a programmer. In his spare time, he contributed his programming skills to create the software that makes live game auctions more efficient. He used this software, and contributed his time as well, in past years to both the Origins and Gen Con live game auctions. In 2007, he formed The Partnership with Jonathan Huston, to take over actual management of the Gen Con auction. In 2015 Jonathan retired from the auction and a new partnership was formed by adding long-time volunteer Catherine Fontaine and Ed Bryan to the leadership team. Catherine Fountaine is the manager of both the Origins and Gen Con auctions. She organizes the hotels, the volunteers, the schedule, and in all ways is the master of the auctions. Ed Bryan handles the financial aspects of the auction. Arranging insurance, banking, and other tedious endeavors without which the auction could not function.